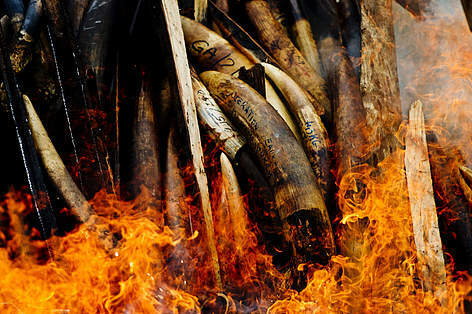 Elephant tusks go up in flames. Gabon's stockpile of ivory seized from elephant poachers and illegal ivory dealers is burned in the nation's capital, Libreville. The burn, set oiff by the President of Gabon beckons in a new era in the country's commitment to put an end to poaching and other wild life crimes, Libreville, Gabon, 27.06.2012. Over the past 15 years, the Congo Basin has lost almost two-thirds of its remaining forest elephants to ivory poachers. 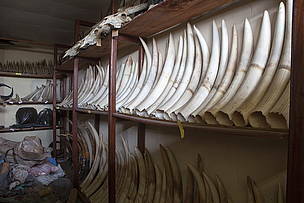 Its forests are also being emptied of wildlife for the bushmeat trade. More than 1 million tonnes of bushmeat is consumed in the Congo Basin each year. This is the equivalent of almost 4 million cattle. Local subsistence hunting has been overtaken by commercial hunting for urban centres. The bushmeat trade has taken on such dimensions that almost all species of large and medium-sized mammals and birds are threatened. 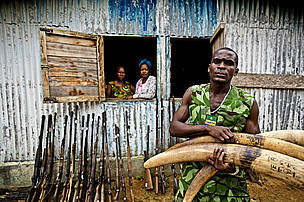 Mba Ndong Marius, an Eco Guard from Oyem hold seized Ivory tusks. Create and manage protected areas: Protected areas remain by far the most effective tool for long-term biodiversity conservation. Protect wildlife in logging concessions: By providing workers and their families with alternative proteins, and controlling access roads for bushmeat poachers, logging companies can be key partners in wildlife conservation. Clamp down on wildlife crime: We put wildlife crime and illegal hunting on the highest political agendas in the region, and lobbying for stronger laws that will place illicit wildlife trade on the same level as illegal trade in drugs or arms. Address weak governance and corruption: We expose government officials involved in the illegal wildlife trade and congratulate governments that are showing zero tolerance for corruption. Build capacity and support: We help strengthen law enforcement, anti-poaching, and awareness-raising activities. Reduce demand: In cooperation with our offices and partners in Southeast Asia, we work on demand reduction strategies for illegal wildlife products such as ivory and great apes.